Aside from a few bigger companies that fear no controversy, most small to medium-sized businesses are very passive with their social media presence. It’s like, they are aware of what social media is, and put up a page. However, they hardly do anything with it aside from the bare minimum. It’s almost like they understand the media part of “Social Media”, but don’t understand its use as an interactive platform. So, I am going to go over some ways that you can make your social media more social. One of the major things that people do on their private social media, is brag about the good things that happen in their lives. Sometimes, its a picture of a scrumptious meal, other times, it’s a photo of an amazing outfit or a breathtaking view. The point is, that if something awesome is happening in their lives, they are going to feel the need to brag about it. Why shouldn’t businesses social media accounts do the same thing? It always brings a boost to someone’s day when they get a chance to brag about something they love to do, and it gives your audience on social media a chance to take part in what makes the people in your workplace excited. For example, I know that one of the few things that everyone on the internet can agree on is that baby animals are adorable. The Virginia Aquarium decided to throw down a challenge that their animals were cuter. After that, a friendly “twitter war” from every zoo and animal rescue center was declared over which animals were the cutest. Who won? Everyone. Audiences got to see some adorable animals, the zoos got some free promotion, and everyone was left feeling happy. And it doesn’t have to stop! Not all friendly twitter wars need to be about adorable baby animals! It can be about how ridiculous someone could dress up in a costume shop, or how much cool stuff can be found in a retail store, or how creatively a grocer can stack the soda display. The possibilities are endless! As long as things are kept light-hearted and amusing, there would be no reason that you shouldn’t brag about your business social media page. So, why don’t you try a new approach to your business’s publicity by collaborating for a charity? Find a cause that you have in common with your corporate business rivals and create a charity event. Maybe the public schools in your area are underfunded? Or perhaps, you both know a children’s hospital that you would be willing to donate to? Whatever the cause, as long as you can be seen doing right by your local community, you will only receive the best of publicity. And what is one of the best ways to record and share a collaborative charity event? Your company social media. When you do something for your community, people will take notice and every business needs the occasional positive attention. We are Purple Tie Guys, Social Media Experts, SEO Enthusiasts and Top-notch Web Designers from North Alabama. If you like what you read, check out this article! Or this one! If you want to book an appointment, Click here and check out the Pop-Up! Like anyone who has a specialized job or skill, you often live, breathe and die by your knowledge of your trade. Naturally, that means you incorporate it to as much of your daily life as possible. My sister, for example, is a psychology student, and she can’t go a day without noticing things that factor into an individual person’s behavior. It is the same way with me and marketing or visual design. So it should come as no surprise that I, a person who has dedicated herself to a career of marketing in a business filled with social media experts, notice a trend in businesses and their social media accounts. Any business owner with a brick and mortar store will tell you that the most important thing to do, to gain business, is to interact with your customers. A good employee and a good store owner would go out of their way to ask customers how their day was, figure out what they are interested in, and find something in common. If that’s the foundation of customer interaction, then why on Earth should the level of customer service go away as soon as your business became digital? People are using social media to inform their purchase decisions more than ever! Why waste an opportunity to engage with them? 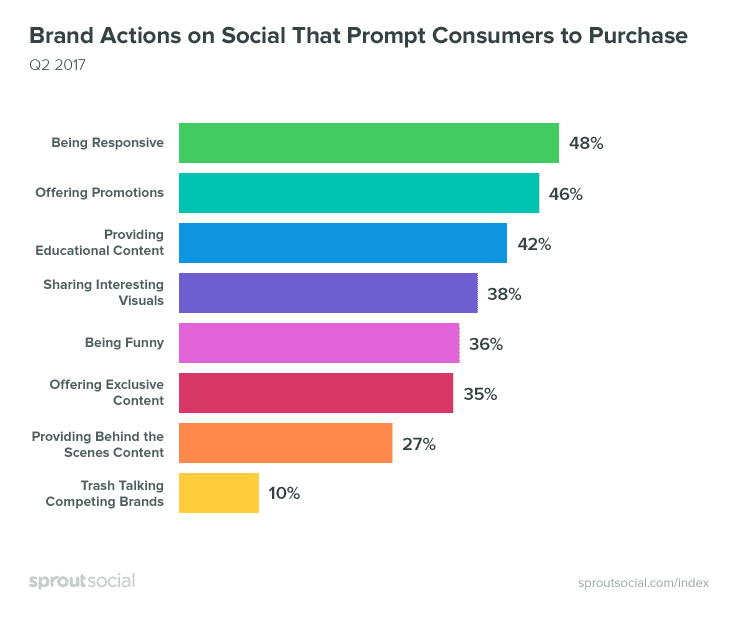 Heck, even in the latest study that polled multiple customers, they stated that response was the utmost important thing to them on a business’s social media page! When people visit your social media account or add you as a friend, they are doing the digital version of walking through your door and looking around. If you do not provide them with a friendly greeting or are silently watching them comment, you are literally doing the opposite of customer service. It would be no different from ignoring somebody while they are talking to you. It doesn’t need to even be an overly official or a grand gesture. A simple “Thanks for liking our page!” is enough. Staying silent on your social media is doing a disservice to your business because customers will not have made a connection, ultimately leaving your business to be forgotten. Whether your company has a mascot, or if the face of the company is its workers, it is beneficial for your business to use social media to engage in public posts. By striking up a conversation or posing a question to your audience, you are giving the public a stronger impression of your brand. This may seem difficult to someone who is not “social media-minded” or knows any social media experts. However, your customers will find your company more likable if they feel they have someone or something to relate to. And the best way to relate to someone is an open conversation. For instance, most people work at a 9-5 job. A simple statement of “Yikes! It’s another Manic Monday!” or “Free at last on Friday night!” are ways to get people to relate to you and by association your company in a tasteful and harmless way with a pinch of humor. If you are not qualified to talk about a topic, do not engage in that conversation. Don’t state opinion as fact or declare something without evidence. Avoid talking about sensitive topics things like politics or religion unless it is your literal business. Be polite with people engaging you in conversation. Spell and grammar check everything before you post. Never post when you are tired or angry. A clothing store employee posting about their terrible breakup and using the companies Facebook business page. A restaurant business owner stating on Twitter that he was sick of immigrants taking over the country. He then states that he spots a few illegals in a rival restaurant from across the street, in hopes of destroying their reputation. More suggestions in Part 2!